Boron Carbide is known as one of the hardest materials commercially available. This venturi design will increase your rate of production up to 50% over straight bore nozzles. The same carbide insert in this nozzle is also available in the lighter FAP style, which is threaded. K sizes available: 3/16”, 1/4”, 5/16”, and 3/8”. 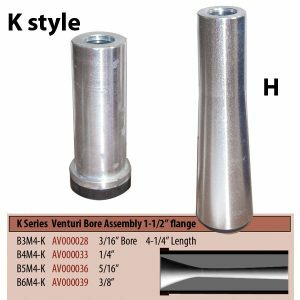 H style sizes are: 1/8″, 3/16″, 1/4″, and 5/32″. AV000028 K NOZZLE B3M4-K BORON 3/16"AV000033 K NOZZLE B4M4-K BORON 1/4"AV000036 K NOZZLE B5M4-K BORON 5/16"AV000039 K NOZZLE B6M4-K BORON 3/8"AV000023 H NOZZLE B2-1/2L4-H BORON 5/32"AV000024 H NOZZLE B2L4-H BORON 1/8"AV000025 H NOZZLE B3L4-H BORON 3/16"AV000029 H NOZZLE B4L4-H BORON 1/4"
AV000028 K NOZZLE B3M4-K BORON 3/16"
AV000033 K NOZZLE B4M4-K BORON 1/4"
AV000036 K NOZZLE B5M4-K BORON 5/16"
AV000039 K NOZZLE B6M4-K BORON 3/8"
AV000023 H NOZZLE B2-1/2L4-H BORON 5/32"
AV000024 H NOZZLE B2L4-H BORON 1/8"
AV000025 H NOZZLE B3L4-H BORON 3/16"
AV000029 H NOZZLE B4L4-H BORON 1/4"